Bursting with attitude and heart, Hollywood's first Asian-centric rom-com in years makes up for lost time in a big way. “We’re comfortable” says Nick Young (Henry Golding, mega-confident in his feature debut), a handsome Oxford-educated NYU professor, when he’s asked about his background by Rachel (Fresh Off the Boat’s Constance Wu), who knows nothing about how loaded he is after a year of their dating. Like Rachel, we’re a touch taken aback about nonchalant he is, especially when “comfortable” turns out to be a fortune, but Nick isn’t snobby about it—it’s just family money. Meet the family. 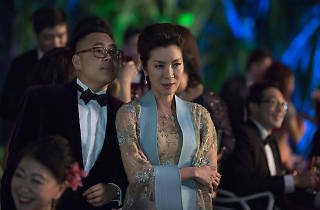 Crazy Rich Asians, the 2013 literary sensation by Kevin Kwan, is finally a Hollywood movie, the first with an all-Asian cast and director since Wayne Wang’s The Joy Luck Club 25 years ago. Seeing this kind of onscreen representation is incredibly satisfying, especially via Kwan’s rich page-turner (loosely based on the author's real life), loaded with cattiness but also plenty of Asian diversity, from wholesome friends and wise confidantes to jealous mean girls and scheming parents. Fittingly, the movie follows suit: It’s a reinvented romantic comedy, sassy and fun, that doesn’t necessarily rely on obvious tropes and is worth the wait. In a deeper way, Crazy Rich Asians is truly groundbreaking (especially now, in our xenophobic moment), paying attention to cultural nuances that rarely make the multiplex. To hear your mother’s regional Chinese dialect spoken in a major Hollywood film is an occasion for no small amount of pride. Nick plans a trip back home to luxurious Singapore for his best friend’s wedding so he can introduce Rachel to the family and let them know that he’s serious about her (marrying serious). Far from an escape, though, their trip becomes a psychological nightmare, as a bachelorette party brings out the pettiness in one of Nick’s ex-girlfriends. 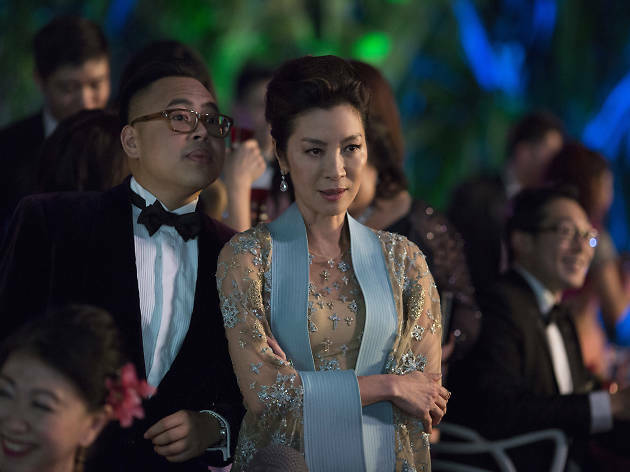 Even worse is a moment of confrontation between our heroine and the matriarch of the Young clan, Eleanor (Michelle Yeoh, impeccably dressed in designer duds, and a force to be reckoned with), who bluntly tells her she just isn’t enough for her son. Beneath its glitz and glamour, Crazy Rich Asians has something of a familiar set-up: the story of two lovers from different walks of life who are willing to challenge tradition for their own happiness. But the tale is infused with a modern sense of money and personal reinvention. It wouldn’t be a proper rom-com without a spectacular montage of makeovers (costars Nico Santos and Brooklyn’s magnetic Awkwafina are your new #bestfriendgoals), but it also features a snappy sequence of fancy brand-name mentions as if they were as accessible as the Gap or Uniqlo. The ostentatious flow of wealth becomes a comic facet in itself, never fully endorsed so much as offered up for our side eye. Working from a smartly condensed script by Peter Chiarelli and Adele Lim that retains the economic essence of the novel, director Jon M. Chu (stepping up from his Step Up movies) masterfully peppers the tale with epic views of Singapore’s Gardens by the Bay, an Avengers–style ensemble cast, expert-level bitchiness and a euphoric dance party. Wear your favorite jade and pearls—you’ll be clutching them.